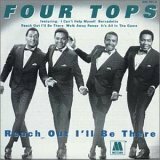 The Four Tops: "Four" is for the modesty of a tight group of friends. "Tops" is for their incredible talent and success. These R&B singers stayed together for over 40 years--several forevers in the music business! And those who could didn't stop singing. It began in the working-class neighborhoods of mid-1950s Detroit. A birthday party brought four students from two high schools together: Renaldo "Obie" Benson, Lawrence Payton, Abdul "Duke" Fakir, and Levi Stubbs. Their voices merged for the first time that day. It was a match meant to last. After graduating, the Four Aims cut a record with Chess, where they took on the "Tops" to distinguish themselves from the Ames Brothers. "Kiss Me Baby" went nowhere, as did stints at other labels, including Columbia. They honed their silky lounge act and toured with singers like Billy Eckstine, but the public paid them little heed. Elsewhere, the man who'd set up their 1956 Chess audition, Payton's cousin Roquel Billy Davis, partnered with another songwriter named Berry Gordy. The up-and-coming pop maven tried to woo the Four Tops to his new company. They declined, but in 1963 they finally joined Motown, now an established hit-maker. The jazzy pop pros nearly sank on the company's Workshop label. It afforded them one unreleased album before they turned to R&B--and composers Holland-Dozier-Holland. After a decade of obscurity, they ascended the charts with 1964's "Baby I Need Your Loving." Then, the avalanche. "I Can't Help Myself (Sugar Pie, Honey Bunch)" went #1 in 1965. "It's the Same Old Song" penetrated the Top 5. "Shake Me, Wake Me (When It's Over)" and other singles in 1966 kept their dream going. At the end of that year, the Four Tops unleashed "Reach Out (I'll Be There)," a staggering showcase for all the talents involved. It would perch atop the Four Tops discography as its crown jewel. Other Four Tops songs like "Standing in the Shadows of Love" and "Bernadette" brought still more intensity and imagination to Motown music. The whistling tenor-tenor-baritone of Fakir, Payton, and Benson and the stirring cries of Stubbs overwhelmed pop and R&B with a grander, more earthshaking vocal mix. Not bad for some supper club veterans! Not that they'd abandoned sweet standards and live acts. They didn't dance like the Pips or the Temptations, and even avoided classes. But their swinging, engaging performances kept audiences smiling as much as their songs did. After "7 Rooms of Gloom," the Four Tops' chart rankings slid. When Holland-Dozier-Holland left Motown in 1967, the group had to cover "Walk Away Renee" and "If I Were a Carpenter" to climb back up. Darker efforts from Frank Wilson, help from Smokey Robinson (the "Still Water" songs), and performances with Jean Terrell's Supremes ("River Deep-Mountain High") got them glimpsing the top again. Obie Benson even co-wrote some of the pieces on Marvin Gaye's What's Going On. In 1972, Motown moved to L.A. without the Four Tops, who'd chosen to head to ABC-Dunhill. With producers Dennis Lambert and Brian Potter, "Keeper of the Castle" and "Ain't No Woman (Like the One I've Got)" went ka-ching! The magic days, however, had gone with Motown. Their last ABC album was 1978's At the Top. It took three years for the men to make another mark, at Casablanca. Disco-influenced "When She Was My Girl" whooshed up the R&B charts in 1981. A playful song battle with the Temptations on Motown 25 kicked off joint tours with that group and more records under that label. 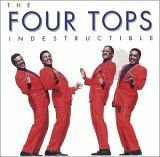 The Four Tops were "Indestructible" Arista artists two years before they entered the Rock and Roll Hall of Fame in 1990. Yet the Four Tops remained, first and foremost, Motown superstars. Even so, their deepest loyalties lay with each other. Levi Stubbs had the voice and kudos to justify going solo. He never did. Any of the Tops could have struck out on his own, or given up during the slow patches, or quit in rage, disgust, or fatigue. No one ever did. In 1997, Lawrence Payton's death from liver cancer finally forced a change. The remaining trio considered retiring, but ultimately went on with ex-Tempt Theo Peoples. When an ailing Stubbs withdrew in 2002, Ronnie McNair filled out the Four. Eight years later, Obie Benson's sudden passing on July 1 from lung cancer left just two original singers still with us. Then, on October 17, 2008, Levi Stubbs, the baritone to end all baritones, ended his time on earth following years of illness. Now, only Duke Fakir remains. Can the Four Tops go on forever? That's not the way nature planned it. But you can bet their music will. Got to read about all my Motown oldies singers after this Four Tops biography? Find them on the homepage!